Checking accounts should be free, period. At least, that’s what I believe. Unfortunately, many of the largest banks in the US have terminated their free checking programs and replaced them with “free checking if you meet the following criteria” programs, a far cry from the free checking programs many companies previously offered. These “free” checking accounts often require customers to jump through hoops or to maintain a certain minimum balance requirement, use direct deposit, or use bill pay. Some banks even require a combination of these services before they will give you a “free” checking account. But they still get you on the back end in the form of ATM fees, overdraft fees, expensive checks, maintenance fees, and more often than not, hold your minimum balance hostage in a non-interest bearing account. You deserve better than that. But don’t fear, we have some great advice on different banks you could choose. Are you using a free online checking account, or are you paying too much? These “gotcha” fees were the driving force behind us creating this list of the best online checking accounts. Most consumers need a checking account which will perform well without hassles or fees. It would be nice to be able to earn a little interest on your money as well. These are the main criteria used to create this list of the top internet checking accounts – FDIC insured, no monthly maintenance fees (or very easy to avoid fees), convenient features, wide ATM access, nationwide account access, and an interest-bearing checking account. One more note – several of these banks aren’t the behemoths you might be familiar with. For the most part, these banks offer their services online where costs are lower. This decreases costs to the consumer and allows banks to charge fewer fees. Thanks to technology, banking is very different than it was a decade ago. Just about everyone is managing their banking needs online or through an app. While being one of “the best online checking account” doesn’t REQUIRE a great smartphone app, it helps. There are some people that will never go to a physical branch of their bank, and that’s where a useful and easy to use app comes in. If a sign-up bonus for opening a new bank account gets your attention, then I’d recommend looking at the Chase Total Checking® Account. You can earn a $200 sign up bonus if you meet the requirements as outlined on their website. I should note that Chase Bank is free if you meet certain requirements, such as maintaining a monthly direct deposits totaling $500 or more made into your account, maintaining a balance at the beginning of each day of $1,500 or more in your checking account, or maintaining an average beginning day balance of $5,000 or more in any combination of this account and linked qualifying Chase checking, savings and other balances. Yes, this qualifies as having some hoops to jump through. But these are easily attainable for most people, and the $200 sign up bonus combined with the availability of Chase Banking and ATM locations makes the Chase Total Checking® Account a top choice for many. Chase Bank also offers a business checking account, for those who also need a business banking account, making Chase a well-rounded option for many. For more information, you can read our Chase Bank Checking Account review. 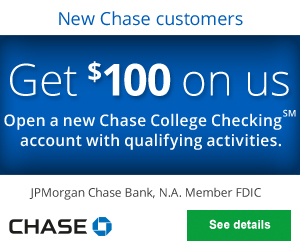 Or visit their website: Chase Total Checking® Account. USAA Federal Savings Bank. I’ve been a USAA member for well over a decade now, stemming from my days in the US Air Force. You do need to have a military affiliation (current or former member of the military, or son or daughter of USAA member) to become a USAA member and use their banking and other products and services. That said, USAA Classic Checking is among the best in the nation, offering a truly free checking account with no monthly fees, and free ATM reimbursements (up to $15 per month). They don’t charge for using an ATM, and they reimburse you when you use another bank’s ATMs. That has saved me a lot of money over the years. USAA also offers free checks, an online savings account, mobile deposit, and many other great features. As a member for over a decade, I can’t recommend them enough. Note: We have a full USAA Review on our sister site, The Military Wallet. When searching for a college checking account, I recommend students get an account that not only has online access, but also has a wide national footprint, just in case they need to visit a brick and mortar location, or they need access to an ATM. The Chase College CheckingSM account fits that bill nicely, as they have nearly 5,000 branches and 16,000 ATM locations. College students should also look for an account that has a low minimum balance requirement. Chase again meets the bill. There is a $25 minimum deposit to open an account and a $6 monthly fee, which is waived for up to five years if you are a student between the ages of 17 and 24. Visit the Chase bank website for additional fees and account features. For more information or to open a checking account online, visit the Chase College CheckingSM page. The BBVA Compass Checking combines an excellent online savings account (among the highest in the nation) with a great online checking account option. While you may not be familiar with BBVA Compass, they are actually one of the largest commercial banks in the U.S. by market share. BBVA Compass checking accounts features Free Online Banking, Mobile Banking, and Bill Pay, and provides access to all BBVA ATMs as well as the Allpoint® ATM network, which features over 38,000 free ATMs. There are several internet checking account options with BBVA, including one that pays interest and offers ATM fee rebates (up to two per month). However, some of the accounts may have fees unless you meet the minimum requirements to avoid fees, such as maintaining a minimum balance. That said, it’s easy enough to open the free account if you don’t qualify for the fees to be waived on the premium account. If you can avoid fees, the premium accounts that pay interest are a very nice banking option. Discover Bank. Discover is better known as an issuer of credit cards, but their savings and checking accounts are actually among the best in the business. Discover Bank has no minimum balance requirement, no monthly maintenance fees, free online bill pay, debit card, no ATM fees plus reimbursement of other banks’ ATM fees, access to over 60,000 fee-free ATMs, online access, immediate transfers between Discover accounts, no online transfer fees, and no fees for standard check orders. Discover Bank also has a top-notch savings account which offers some of the best interest rates in the nation, making this an attractive option if you prefer to link your accounts. The best part? You can earn up to $120 in rewards each year by using your Discover Bank Checking Account. You can earn $0.10 for each debit card transaction, every bill you pay online, and each time a check you write clears (up to 100 combined transactions each month). I love using my cash rewards credit cards, but there are times when you need to use your checking account. Why not get rewarded at the same time? EverBank is best for customers who maintain a relatively high balance in their checking accounts, as it requires a minimum of $5,000 to open an account. The benefit of this is EverBank’s Yield Pledge Checking account interest rates rival or exceed the savings account interest rates found at many popular “big bank” savings accounts. EverBank’s high-interest savings account is also consistently among the highest in the nation, making it a good idea to link these accounts to ensure you always receive a solid return on your savings. EverBank checking accounts feature unlimited check writing, mobile checking, and one of the coolest features in the industry – the ability to make check deposits online by scanning a check and uploading it to your account. The high interest rates and conveniences make this a good option for those who like to keep a little extra cash on hand. For more information or to open a checking account online visit the Everbank website. Ally Bank has made major strides over the last several years in terms of features and customer service. Ally Bank now offers best in class checking and savings accounts, with features found in few locations. The Ally Interest Checking account features an interest-bearing account, free bill pay, free debit card, free ATM usage (ATM fees are reimbursed each month), and free checks with unlimited check writing ability. Free checks are a nice bonus, as many banks charge $20-30 for a set of checks (though you can usually save money buying checks from Costco or other locations). Finally, there are no minimum balance requirements and no monthly fees. For more information or to open a checking account online visit the Ally Bank website, or read our Ally Bank Review. Capital One bought the US branch of ING Direct and re-branded it as Capital One 360. The only thing they changed was the name and the brand colors. The simple to use interface, great rates, and other features remain unchanged. I’ve been a customer of Capital One 360 for over 10 years now. They were one of the pioneers in direct banking and offer an easy to use account which can be linked to your Capital One 360 Savings Account (still one of the best in the business), as well as to your ShareBuilder Investing Account if you have one. Features include a solid interest rate, ability to link accounts, free bill pay, free debit card, access to over 38,000 free Allpoint® ATMs, no minimum balance requirement, and no monthly fees. To top it off, Capital One 360 accounts also offer the ability to send checks online, ability to create sub-accounts for easier management, ability to transfer money to other Capital One 360 members for free (a very cool peer to peer system similar to PayPal, but limited to other Capital One 360 members). Capital One 360 also has a popular referral program, where members can earn money by referring Capital One 360 to their friends and family members. For more information or to open a checking account online visit their website: Capital One 360. FNBO Direct. First National Bank of Omaha is the largest privately owned bank in the US. They have long been a large regional bank, but have expanded to the national level over the last few years with their online branch – FNBO Direct. Their online checking account has no minimum balance requirements or monthly fees, and they offer competitive interest rates for checking accounts. If you maintain a low monthly balance in your checking account, then FNBO is a nice option since most of the large banks require a minimum balance to avoid fees for their checking accounts. Additional perks include free bill pay, a free VISA debit card, a high interest savings account option which you can link to your checking account, high interest CDs, an excellent rewards card, ability to transfer money via e-mail or your cell phone, and their website features a user-friendly interface. You can read our full FNBO Direct review here. Citibank is one of the largest financial institutions on the US, with hundreds of physical branches, and access to 29,000 fee-free ATMs nationwide. Depending on which checking account you get with Citi, you may also be eligible for ATM fee reimbursements. Each Citibank checking account comes with online banking, free online bill pay, free mobile banking with CitiMobile, online check images, paperless bank statements, and 24/7 customer support. Citibank is also a full-service bank which offers a variety of other services including investment products and loans, credit cards, and mortgage products. A minimum balance is required for the account to be free. Here is a more in-depth Citibank Checking Account Review. Zions Bank is a regional bank which has been around for over 135 years. Their attractive no fee online checking account has served as a great way for them to serve a wider customer base. The Zions Bank High Yield Internet Checking is an interest-bearing online checking account that offers competitive rates based on the balance you maintain in your account. Aurora Bank is headquartered in Wilmington, Delaware and brings over 85 years of banking experience to the table. The Aurora Bank Checking Account with Interest offers competitive interest rates, free ATM withdrawals from an extensive, nationwide network, check writing, debit card, electronic transfers, and direct deposit. Your account is eligible for overdraft protection and your first set of checks is free. Aurora Bank also offers a wide range of consumer, business, and commercial banking, including savings, checking, money market accounts, debit cards, CDs, a variety of loan options, and more. For more information or to open a checking account online visit the Aurora Bank website. Bank of Internet USA is one of the more obscure banks on our list, but that doesn’t mean that you should count them out of your search. With their “Rewards Checking” account, you can earn up to 1.25% APY, which is drastically higher than you’re going to earn with just about any other checking account. There are a few requirements that you’ll have to meet, but most of them are simple. With Bank of Inteneaurorast USA, you’ll be able to enjoy online banking, unlimited domestic ATM reimbursements, and some cash back purchase rewards. Just like the other banks on our list, there is no monthly fees and no minimum balance that you have to maintain. While it might sound like an odd choice, if you’re looking for another high-yield checking account, then look no further than MemoryBank’s EarnMore Account. If you open up one of these accounts, you can enjoy a stunning 1.50% APY for the first year that you have the account. Like the Bank of Interest account, you’ll need to meet some simple requirements to get the high-yield returns. As long as you have one direct deposit into your checking account and use your debit card 5 times every month, then you can take advantage of their high APY. After the first year is over, the APY is going to be around 1.0%, which is still much higher than the competitors on the list. If you’re looking for a company that’s going to reward you for the cash in your checking account, the MemoryBank is an excellent option. One of the obvious downsides is that you won’t have access to thousands of physical branches across the country like you will with some options. Bank5 might sound like the name of a boy-band, they actually have one of the best free online checking accounts on the market. They have a “Connect High-Interest Checking Account” that is easy to open and has several benefits. They have free mobile banking and free online banking that will let you use bill pay and receive eStatements for no charge. One of the most notable advantages of their online checking account is the 0.76% APY and free ATM use anywhere (which a few exceptions). Bank5 will reimburse your ATM fees and surcharges for up to $15 every statement cycle. This is a unique advantage that you won’t find with many of the other banks. Another benefit of opening a Connect High-Interest Checking account is having access to their UChoose Rewards, which rewards you for using your debit card. Whenever you use your Bank5 Connect card, you’ll earn points. For every $2 that you spend, you’ll earn 1 point. You can use those points to redeem for thousands of options, everything from gift cards to vacation packages. Aside from fees, APY, and limitations, there are a couple of other things that you should take note of when you’re looking for the best online checking account. I like to look for banks that offer multiple services such as checking, savings, certificates of deposit, and more. Some banks focus on one or two services. Other banks may offer additional services such as credit cards, loans, mortgages, and even insurance. Choosing a bank that only offers a limited number of services is fine if you only need those specific services (this is common, for example, with online savings accounts). Just be sure to compare your needs before settling on a bank. Finally, give some consideration to customer service. When making this list of best free online checking accounts, customer service was taken into account, but you should always do your research before you pick a bank. When you’re looking at customer service ratings and reviews, keep in mind that there is always going to be some disgruntled customers. Regardless of how kind or courteous their customer service is, there is always going to be some negative reviews, take those with a grain of salt. Instead of focusing on one specific review, look for any trends or common complaints that their customers have. Many local banks, regional banks, and credit unions offer similar deals and can be a great place to open a free checking account. However, there are a couple downsides – many times they do not offer an extensive ATM network, or are limited in other ways. I recommend comparing online checking accounts from multiple financial institutions to find the one that best meets your needs.